In 1982, Argentina invaded the Falkland Islands in the South Atlantic, which had long been the subject of a sovereignty dispute with Britain. They had expected the British to accept their occupation, but were surprised when the British instead assembled a fleet to retake the islands. 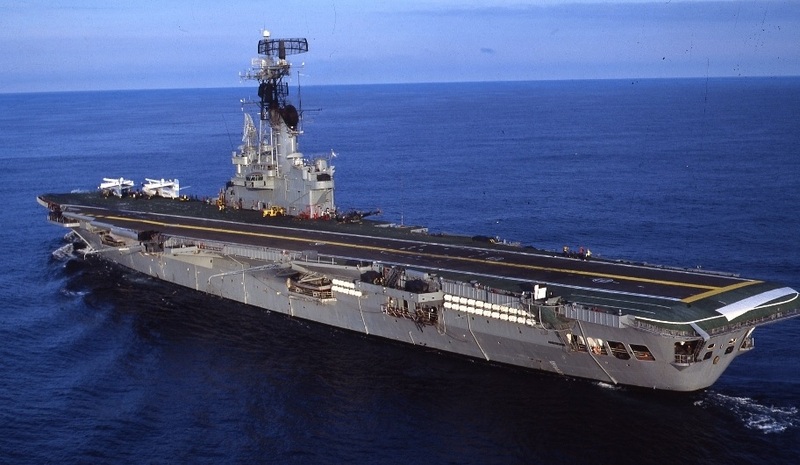 The carrier group, centered around HMS Hermes and HMS Invincible, took a few days to sort itself out at Ascension Island and take on extra Harriers, before sortieing for the South Atlantic on April 18th. The task force moved immediately to a war footing. 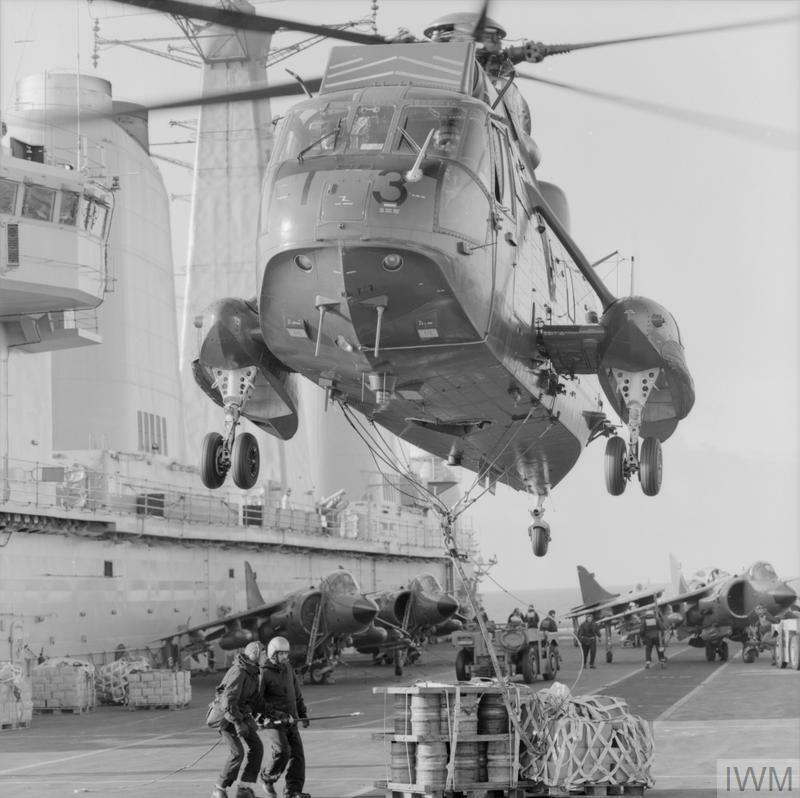 An anti-submarine screen of Sea Kings was airborne day and night, the 20 aircraft flying a total of 2,253 sorties during operations in the South Atlantic. One crashed on April 23rd, and a crewman, Petty Officer B. Casey, was killed, the first casualty of what the British dubbed Operation Corporate. Operations spaces and weapons were manned around the clock, and formica panels and mirrors were removed to reduce the effects of damage. All personnel were prohibited from sleeping below the waterline, exacerbating the crowding on the carriers. Around noon on April 21st came the first encounter with the enemy. 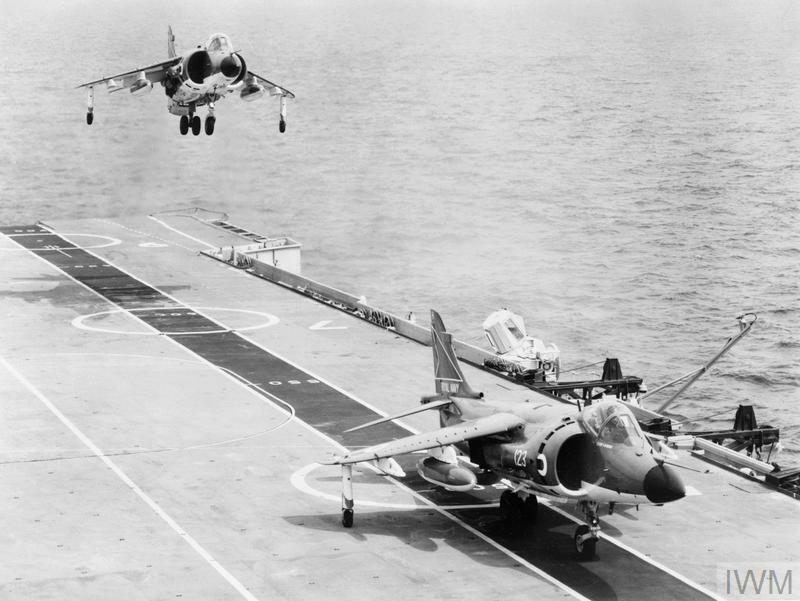 A high-altitude contact was detected, and Sea Harriers were scrambled to intercept it. They sighted a Boeing 707, which turned out to belong to the Argentine Air Force. This aircraft, 2,300 nm from the nearest bit of Argentina, had shown the skill and courage to locate and close with a heavily-armed task force run by one of the world's leading navies. Another 707 appeared overhead 12 hours later, and the Sea Harriers again were launched to intercept. The shadowers arrived regularly over the next few days, usually being turned away by the Harriers. This worried the British, who made sweeps with Nimrods out of Ascension to make sure that they weren't guiding a surface force or submarine in to intercept. On April 24th, as South Georgia was being retaken, the British announced that any Argentine aircraft, military or civilian, that was shadowing the Task Force, would be shot down. The next day saw the final rendezvous of the carriers and their escorts, giving Admiral Woodward four guided missile destroyers,1 four frigates2 and three replenishment ships3 in addition to his two carriers. He had planned to exercise his carriers against one another to hone their air-defense system, but bad weather thwarted him. On the afternoon of April 29th, the task force began its last major replenishment at a point 500 miles east of Stanley. There, it was joined by Plymouth and Brilliant, carrying SAS and SBS commandos from South Georgia.4 This replenishment lasted almost 24 hours, and as it was completed, a surface ship was detected nearby. A Sea Harrier was dispatched, and the ship turned out to be an Argentine trawler. The trawler appeared to be following the task force, but this was never proven, and she was able to depart unmolested. Finally, late on April 30th, the 14 ships of the Task Force began their run-in to the newly-declared Total Exclusion Zone, a 200-mile radius area where any ship or aircraft that was supporting the Argentine occupation of the Falklands was liable to be attacked without warning. The Argentine Navy was a reasonably powerful force in its own right. Ironically, Argentina was the only export customer for the Type 42 destroyers which formed the core of Woodward's screen, having received a pair of them in 1976 and 1981. They were primarily escorts for the carrier Veinticinco de Mayo, previously the British light carrier HMS Venerable. Argentina's second surface force was American in origin. The WWII-era light cruiser Phoenix had been rechristened General Belgrano, and was escorted by a pair of Allen M Sumner class destroyers that had been refitted with French Exocet anti-ship missiles.6 Exocets also armed the three Drummond class corvettes Argentina had bought from France. The submarine force was small, but similarly international. Besides Santa Fe, only one other submarine was operational, the German-built San Luis.7 She operated against the British, but was handicapped by unreliable torpedoes. The Air Force, despite a lack of expertise in attacking ships, contributed the majority of the forces. 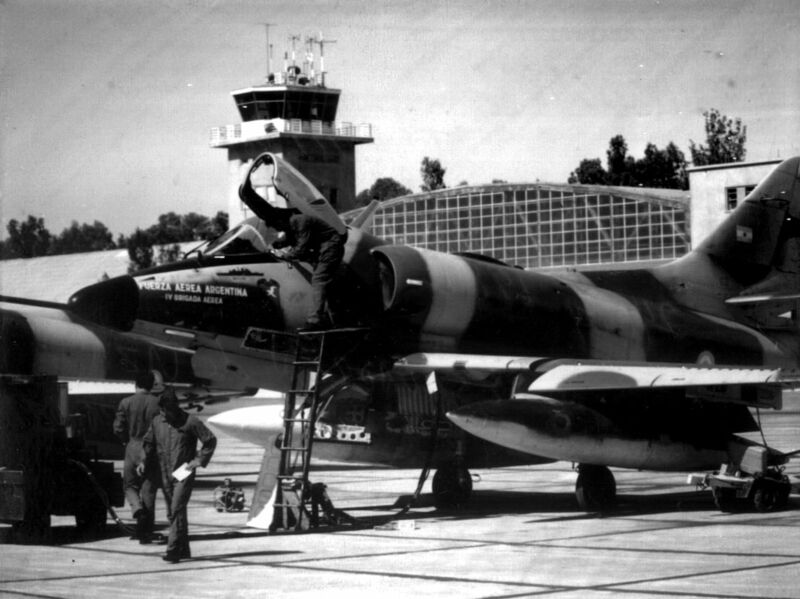 31 A-4Bs and Cs and 19 Daggers would carry out anti-shipping strikes, supported by Mirage III fighters and Canberra bombers for land attack. 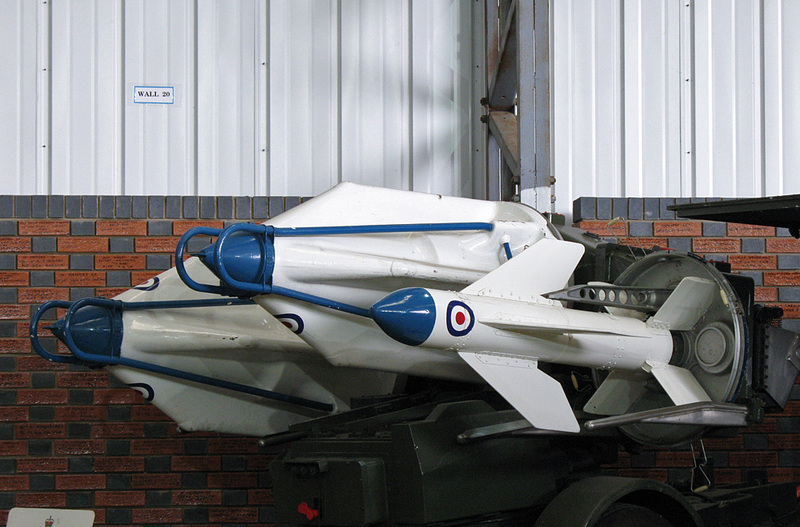 The Daggers and Mirages, lacking aerial refueling capability, would have only minutes over the Falklands and couldn't use their afterburners if they wanted to return home. Argentina's pair of KC-130 tankers allowed slightly more margin to the Skyhawks, but limited the number that could be dispatched in any given strike. On land, the situation for Argentina was not as good. The Marines who had secured the islands were withdrawn, and the two Army mechanized infantry brigades which replaced them had a high proportion of conscripts and serious morale problems. Moreover, they were based in the subtropical northern region of Argentina, and were completely unprepared for the cold Falklands. Against this, they were reasonably well-equipped, and the 11,000 men on the island outnumbered 3 Commando about 2 to 1. More immediately relevant were their air defenses, which were a mix of Roland and Tigercat SAMs and AA guns, most prominently Skyguard systems. On May 1st, these two forces would clash for the first time, as the British launched their initial strike on the defenders of Stanley. That will be our subject for next time. I've been enjoying this series. As a history major in college, I wrote my senior thesis on the use of Exocets in the Falklands War. I was just old enough to have fuzzy childhood memories of seeing the war play out on the evening news. As a war fought at the extremes of capability, it has always fascinated me. As a war fought at the extremes of capability, it has always fascinated me. This is definitely what I find most interesting, too, and have been trying to highlight. The preparations for sailing, turning ships from cruise liners to troopships in three days, and the Black Buck raids in particular are just astonishing examples of heroic logistics. I'll add a "me too" to the degree in which the logistics of the British operation has proven remarkably interesting in this series.